Virginia is disputing evidence that Daryl R. Atkins is retarded. WASHINGTON, June 20 — The Constitution bars the execution of mentally retarded offenders, the Supreme Court declared today in a landmark death penalty ruling based on the majority's view that a "national consensus" now rejected such executions as excessive and inappropriate. Of the 38 states that have a death penalty, 18 now prohibit executing the retarded, up from 2 when the court last considered the question in 1989. This "dramatic shift in the state legislative landscape," especially when anticrime legislation is extremely popular, "provides powerful evidence that today our society views mentally retarded offenders as categorically less culpable than the average criminal," Justice John Paul Stevens wrote for the 6-to-3 majority. The decision, in the case of a Virginia man with an I.Q. of 59 who was convicted of committing a murder and robbery at the age of 18, could ultimately move 200 or more people off death row. Mental health experts believe that as many as 10 percent of those convicted of capital murder are mentally retarded, although states often dispute the claim in individual cases. 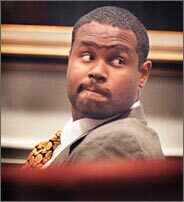 In fact, Virginia is disputing the evidence that the defendant in this case, Daryl R. Atkins, is retarded. The Supreme Court said today that it would be up to the states to develop "appropriate ways" to apply the new constitutional prohibition. The generally accepted definition of mental retardation is an I.Q. of approximately 70 or less accompanied by limitations on abilities like communication or caring for oneself. The dissenters today, Chief Justice William H. Rehnquist and Justices Antonin Scalia and Clarence Thomas, disputed that there was a real or lasting consensus against executing the retarded. In a dissenting opinion that he read from the bench, Justice Scalia said that 18 states out of 38 was only 47 percent, not even half. In the absence of an authentic consensus, the majority had simply enshrined its own views as constitutional law, he said, adding, "The arrogance of this assumption of power takes one's breath away." Further, he said, "there is something to be said for popular abolition of the death penalty; there is nothing to be said for its incremental abolition by this court." Chief Justice Rehnquist said the majority had improperly gone beyond looking at state legislative action to consider polling data and international opinion as well. "If it is evidence of a national consensus for which we are looking, then the viewpoints of other countries simply are not relevant," he said. The 15 countries of the European Union filed a brief on behalf of Mr. Atkins, as did a group of senior American diplomats who told the court that the practice of executing retarded offenders was out of step with much of the world and was a source of friction between the United States and other countries. Amnesty International said that since 1995, only three countries were reported to have executed mentally retarded people: Kyrgyzstan, Japan and the United States, which the organization said had executed 35 mentally retarded defendants since the court allowed states to reinstate the death penalty in 1976. The court's decision today "will provide the U.S. criminal justice system with a critical tool to uphold human rights standards," the organization said. The decision overturns a ruling of the Virginia Supreme Court. While the justices disputed the outcome, there was no dispute on the basic analytic approach, unique to the Eighth Amendment, that depends on a sense of community norms to decide whether a practice violates the prohibition against cruel and unusual punishment. All agreed with the statement of Chief Justice Earl Warren in a 1958 case, Trop v. Dulles, that "the amendment must draw its meaning from the evolving standards of decency that mark the progress of a maturing society." Rather, the debate was over whether the evidence supported the evolution that the majority discerned. The court's previous examination of the retardation question came in 1989 in a Texas case, Penry v. Lynaugh, in which Justice Sandra Day O'Connor's controlling opinion said that there was no current consensus against executing the retarded but kept the court's door open to future developments. The developments came quickly. From the original two states, Georgia and Maryland, the list of states exempting retarded people from capital punishment grew to include New Mexico, Kentucky, Tennessee, Arkansas, Colorado, Washington, Indiana, Kansas, Nebraska, South Dakota, Arizona, Connecticut, Florida, Missouri and New York, which excluded the retarded when it reinstated its death penalty in 1995. The federal death penalty, reinstated in 1988, exempted the retarded. When the court agreed last year to revisit the issue, it did so in a case from North Carolina, but North Carolina abolished the death penalty for the retarded last summer, before that case, McCarver v. North Carolina, No. 00-8727, could be argued. The justices then substituted the case they decided today, Atkins v. Virginia, No. 00-8452. It appeared earlier this year that the Atkins case might become moot as well. In February, the Virginia State Senate voted unanimously to abolish capital punishment for the retarded, but the House decided to delay action until after the Supreme Court decision. Surveying this rapidly changing landscape, Justice Stevens noted that the numbers alone did not tell the full story. "It is not so much the number of these states that is significant, but the consistency of the direction of change," especially in a strong anticrime climate, he said. Even most states that nominally allow executing the retarded were not actually carrying out such executions, Justice Stevens said, concluding, "The practice, therefore, has become truly unusual, and it is fair to say that a national consensus has developed against it." The opinion, joined by Justices O'Connor, Anthony M. Kennedy, David H. Souter, Ruth Bader Ginsburg and Stephen G. Breyer, did not end there. Justice Stevens went on to consider whether there was any reason the court should disregard or disagree with the legislative judgments. He concluded that, to the contrary, the state judgments were supported by a review of various factors making the death penalty particularly inappropriate for retarded defendants. "Some characteristics of mental retardation undermine the strength of the procedural protections that our capital jurisprudence steadfastly guards," Justice Stevens said, adding that as a result, "mentally retarded defendants in the aggregate face a special risk of wrongful execution." Among the factors he cited were their "diminished capacities to understand and process information" and to reason logically and control impulses. These characteristics do not mean that retarded defendants who are competent to stand trial should not face criminal punishment, Justice Stevens said, "but they do diminish their personal culpability" and indicate that the usual justifications for capital punishment, retribution and deterrence, are less applicable than to defendants with normal intelligence. This part of the opinion might have broader significance for the court's death penalty jurisprudence, said one death penalty expert, Professor Michael Mello of Vermont Law School. "It shows that a majority of the court is willing to take a fresh look at the real capital punishment, how the system really works," said Professor Mello, a former defense lawyer who opposes the death penalty. He predicted that the court might be open to revisiting precedents that make it all but impossible for appellate courts to consider assertions of actual innocence if the defendant has not followed exacting procedures. None of the current members of the court hold a position in flat opposition to the death penalty. Neither the majority nor the dissenters discussed the retroactive implications of the decision. Under the court's constitutional jurisprudence, the decision applies retroactively as a general matter, but states could raise objections to granting relief to defendants who had not argued the retardation issue in earlier appeals. If the lower federal courts disagree on how such cases should be handled, the question could conceivably come back to the Supreme Court, where a majority appears ready to grant full retroactivity.